To redeem your warranty please register your details and attach or forward your proof of purchase within 90 days of buying your ECC Timber product. Re-working at the installation site should be limited to cross cutting, boring, drilling or notching. All exposed surfaces should then be given two liberal brush coats of a suitable preservative as recommended by the manufacturer of the industria wood preservative used in the original treatment. It is important to remember that the penetration achieved by brush is less than that achieved in the pre treatment process and it is best to avoid or minimise re-working. Treated wood must not be pointed after treatment. Treated wood must never be rip sawn, thicknessed or planed along its length. If this takes place, it must be returned to the treatment plant and retreated prior to use. The cross cut end of a treated post must never be embedded in the ground. For treated timber to be used in Use Class 4, always put an uncut end in the ground. It is important to achieve good drainage away from the treated post; this can be achieved by placing gravel or loose stones into the hole prior to installing the incised post. If using a cement-based mix to fix posts in the ground, ensure that water can drain away from the foot of the post. Do not make a ‘boot’ for a post out of concrete as this will keep the bottom of a post wet for long periods and increase the risk of decay. Treated wood must not be moved from their original installation and re-installed. 1. This warranty only covers “Incised UC4” fence posts and sleepers supplied by ECC Teo. 2. To activate the 15 year warranty, all details and submissions must be registered as outlined on back page. 3. Registrations for the 15 year warranty must be received no later than 90 days from the invoice date to validate any registration. 5. The guarantee is for the cost of re-supply by ECC Teo, of a component that is proven to have failed as a result of fungal decay or insect attack within 15 years of supply. 6. It does not cover the costs of removal or reinstatement of such components or consequential costs or loss due to failure of the component. 7. To submit a warranty claim you must: Contact the ECC Customer Sales on 0845 3990919 or info@ecc.ie within two weeks of 15 year expiry date to make the request and provide proof of registered warranty, as per written confirmation sent at the time of online warranty registration. (a) A cross section of the timber (minimum 200mm length) exhibiting the product failure due to fungal decay or insect attack that is sufficient for testing. (b) Such other information as ECC Teo may reasonably require such as access to the site of installation etc. (c) A photograph of the affected product in situ. 9. ECC Teo will promptly investigate the complaint and establish the issues surrounding the claim before a final decision is made on product replacement. 10. The terms “rot” and “fungal decay” as used in this Guarantee mean attack by wood destroying fungi that disintegrate the wood cell walls. 11. “Weathering” of wood is not fungal decay or rot of any type or definition and is excluded. 12. The term ‘insect attack’ refers to attack by wood destroying insects that destroy the timber structure such as termites. 13. The term ‘failed’ refers to damage caused by insects and/or fungi to render the component no longer fit for purpose. 14. Only ECC Teo “Incised UC4” Timber treated to Use Class 4 must be used in ground contact situations. 16. The 15 year warranty is not transferable and no alternative will be offered. 17. This guarantee does not affect the statutory rights of the consumer. 2. Accidental Damage or Subsidence. 3. Failure to follow installation recommendations in the ECC 15 year warranty information booklet. 4. Labour associated with removal and replacement of any warranted products. 6. Any ECC Teo ‘ECC Incised’ pressure treated fencing components supplied for use outside of European markets. 7. Removal of Incised timber from their original installation and re- used at a new location. 8. Building poles, commercial vineyard stakes or peeler core landscape timbers. 9. Damage caused by ‘weathering’ of wood, including but not limited to raised grain, splitting, cracking, twisting, warping, shrinkage, swelling or any other physical property of the wood, or where untreated material is exposed by the effects of this weathering. 10. Timber degrade which is the result of the natural movement of wood in service, including weathering, twisting and splitting of components. 11. A piece of treated timber that is cut, drilled or notched after preservation unless the exposed. 12. 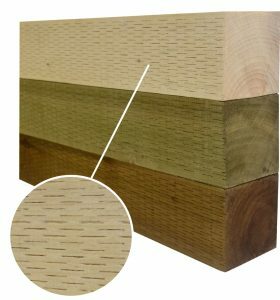 Areas of wood where preservative surface penetration is consistently limited to less than 3mm or is effectively unachievable due to natural variations in the wood substrate and/or abnormal growth characteristics. 13. Mould growth on treated wood products. 14. Damage during transit or in storage.